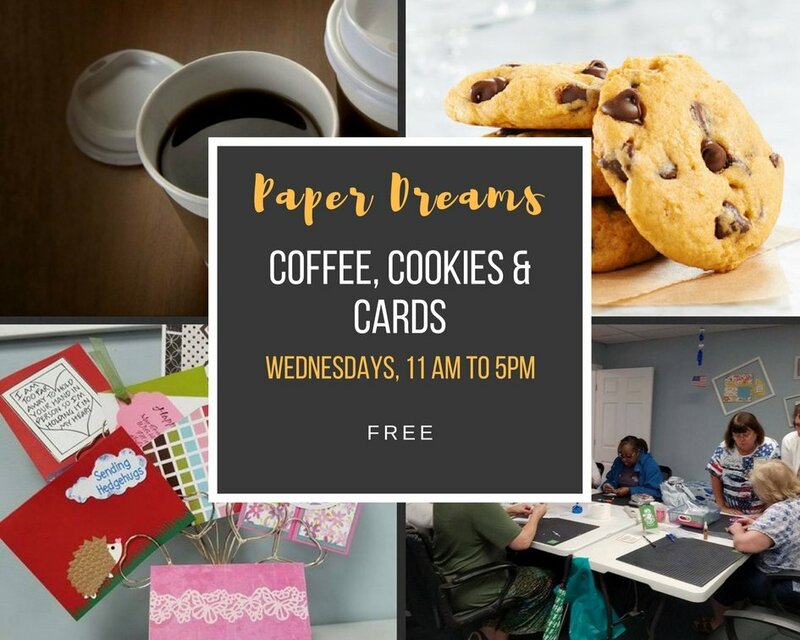 Coffee, Cookies & Cards ... every Wednesday (with a few exceptions) at Paper Dreams! To continue our community outreach, Paper Dreams will host Coffee, Cookies & Cards from 11 am to 5:00 pm. Stop by for an hour .... or four .... and cut, stamp, punch and create cards for different "charities". This is not a facilitated event, so it's not for beginners. If you aren't able to attend but want to participate, feel free to drop cards off at Paper Dreams. Scraps, stamps, punches, and dies will be available for you to make your own designs, or use the sample as a guide. Bring your ideas and your tools. Hope you can come play and participate! Materials Included: Scraps, stamps, ink, punches and dies will be available, as well as the tool table. Requirements: Bring your own tool kit (scissors, pencil, ruler, favorite adhesive, etc) and follow examples given or make your own designs.